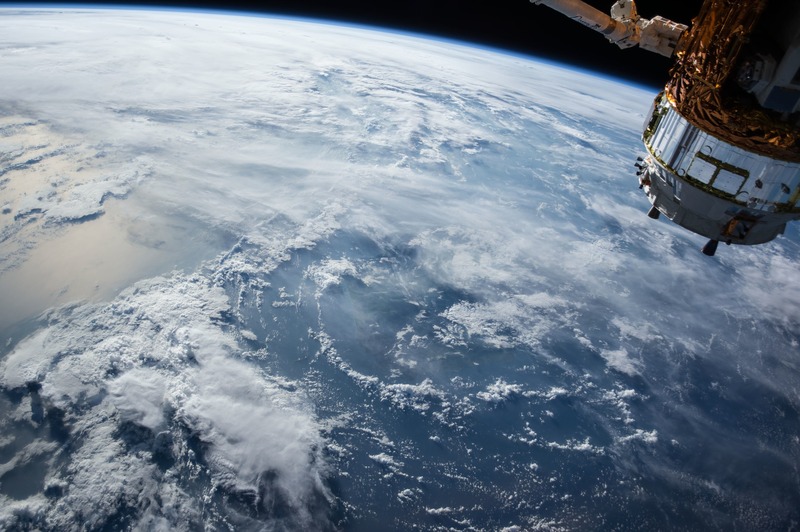 ​Save Our Spaceship: Kids' petition to "make the world a better place"
Hi, my name is Peri. I am 13 and go to school in Canberra. I want to tell you about why some of my classmates and I started an online petition, Save Our Spaceship 2k16. We are trying to make the world a better place by getting our nation's leaders to act on climate change NOW. Climate change is something I have always known about, but it has always been in the background. I have heard lots of people talking about how bad it is and seen pictures of it on Instagram, but mostly all I hear is disagreement and arguments about what we should do. I never really thought about doing anything more about it myself, except what we already do in our house (recycling, using solar power etc.) That was before I realised there was something I COULD do. When my mum showed me a petition from a girl in Victoria that convinced Aldi to agree to stop selling cage eggs, I realised that kids could have a voice, and people would listen to them. I started talking with my friends about what we could do, all the ideas we could come up with. My friends and I decided to put out a petition on Change.org. We are asking our nation's leaders to give us a pinky promise to take urgent action on climate change, to help turn our world into a beautiful healthy place before it is too late. Global warming is one of the biggest issues humans are ever going to face. It makes me sad because if we don't get started fixing it now, my generation is going to be stuck with the bad outcome of so much inaction by governments now. We are too young to vote at this year's election, but we are trying to do all we can to get our voice heard because we think this is an urgent issue. The petition has started a bit slow but we are still hopeful of hitting a big number and getting some political attention. To help the petition along, we are reaching out to big people to help spread the word (because I am only 13 and I don't know that many people). But we are on the way to getting pinky promises: our first pinky promise came from Natalie Atherden who has stood for Parliament in Victoria. Thank you Natalie for getting things started!! This is great. We want lots of pinky promises. Hopefully somebody high up in government will step forward to give us a pinky promise too. Starting the petition has been an amazing experience. I was excited when the signatures started coming in. It was actually working and people were supporting us. More than that, we were getting support from people all over the world. That was pretty awesome. There were people who cared enough to support us even though they don't live in Australia. It made the world seem pretty small. After all, I guess this is what we are trying to say: there is only one spaceship and we are all in it together. My favourite comment so far is "Kids are going to be the warriors to fix the planet – Go Aussie Kids!" This came from Valerie in Canada. 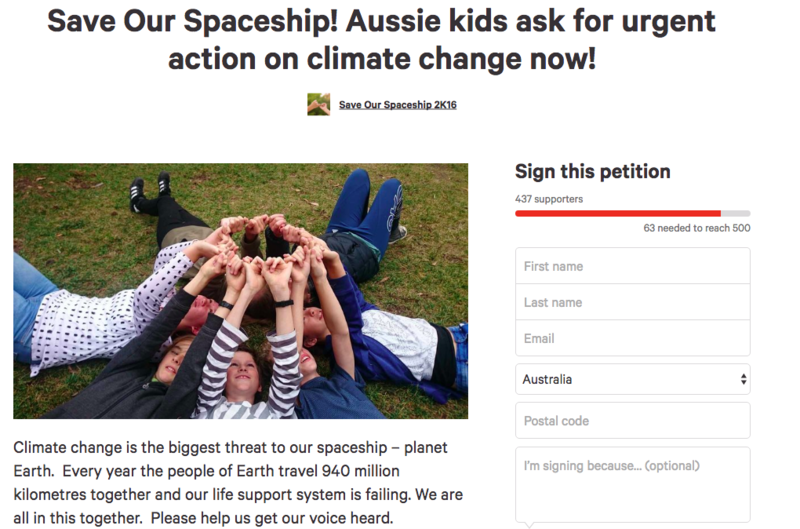 Since starting the petition we have also found out about other groups of teenagers who are doing similar things to us: 'FED UP The Movement' in Brisbane, the Australian Youth Climate Coalition and JIEC in the Mediterranean. That is cool because if we all start working together we will be able to do amazing things. I am just a 13-year-old school kid and in a week there are more than 1000 people on social media talking about my idea. So if I can do something we can all do something. Start by signing our petition! My parents say they will do anything for their kids and I believe every other parent is the same. So stop worrying and feeling depressed by the bad news and start doing small things to build a better world for us together. The research undertaken and opinions expressed by the guest writer/blogger and those providing comments are theirs alone.